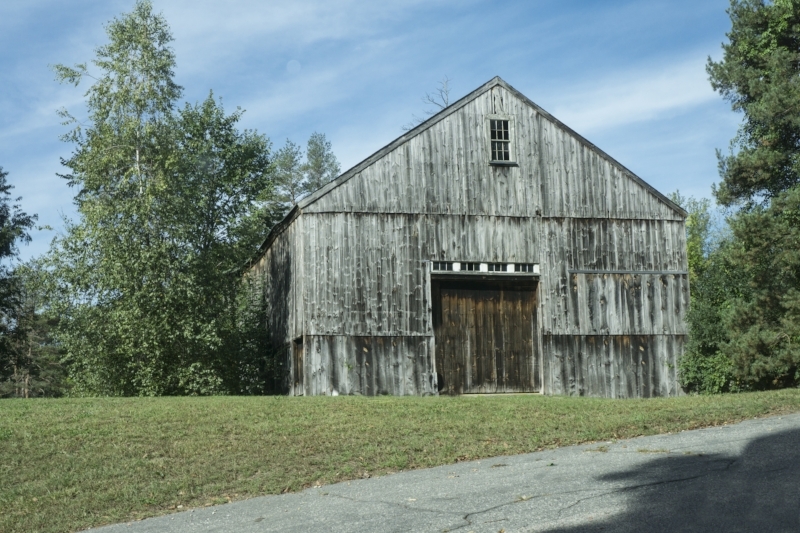 The original 40’x60’ New England style barn, built by Nathan Waters around 1840, was lost 100 years later during the Hurricane of 1938. At that time, Walter Waters, owned the property and used it as a summer home. The only animals on premises were 2 calves and 1 horse. The replacement building, built around 1940 by Sidney Hutchinson, was a barn/garage combination of more modest size, constructed atop the granite walls and foundation stones quarried on site. It was necessary to raze the building in recent years, saving the granite slabs and an original barn beam. Waters Farm was approached by David Stevenson of D M Stevenson Housewright, to save and preserve the Chrobak Barn, located in West Sutton a few miles from the Farm. Stevenson had previously moved the Darling Barn from Darling Lane in the Village of Manchaug and reconstructed it at Waters Farm. The beautiful New England style barn from the Chrobak property is strikingly similar to the original Nathan’s Barn. Believed to be constructed around 1860, the building was a good candidate to be moved. At the time of this update, Spring has arrived. The snow is melting and the final pegs can be removed from beams. Plans will be drafted to lay out the Chrobak barn onto the existing 40’x60’ foundation. Donate your time to help loading and moving timbers. Participate in an on-site lumber milling day at Waters Farm. Support the Buy-a-Board, Build-a-Barn fundraiser, which you can do by credit card or check as seen below. To contribute using your credit card, click on the Buy-a-Board button below to begin your selections. You will be redirected to our credit card order form where you can choose from pre-determined amounts or write in your dollar amount contribution. All donations towards the building of Nathan's Barn are tax deductible and will be used to buy materials to raise the barn itself. As we'd mentioned above, all donations are TAX DEDUCTIBLE.